Making authentic tamales is a multi-step process, but the effort is worthwhile. 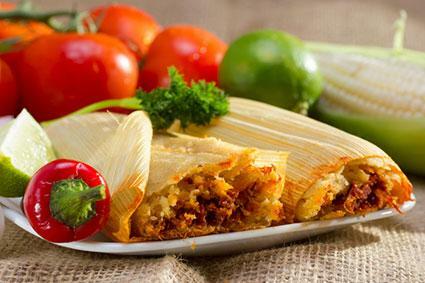 Unlike other Latin American foods like enchiladas, tamales may take a few days to prepare all the components. 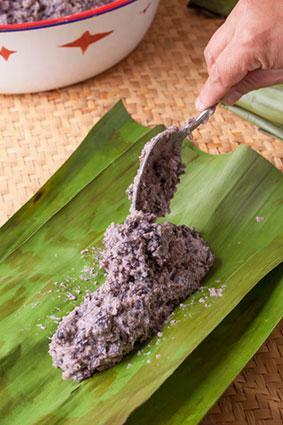 Use the recipes and steps below to create delicious tamales. This recipe makes a big batch. You can halve the recipe to make a smaller batch, but since the process is so involved, making and freezing the tamales in large amounts can save you time. You can make either pork or beef filling for your tamales. If you wish to substitute pork for the beef below, you can do so directly, using pork shoulder. You can also substitute chicken. In a large ovenproof pot, heat the lard or oil on medium-high until it shimmers. Add the beef cubes and cook until beef is browned on all sides, 4 to 5 minutes per side. Remove the beef from the pot with tongs and set it aside in a large bowl. Add the onion and jalapeno to the fat in the pan. Cook, stirring occasionally, until they are soft, about 5 minutes. Return the meat to the pot, adding any juices that have collected in the bowl. Add the oregano, salt, peppercorns, and allspice. Cover the ingredients with water and bring the pot to a simmer. Reduce the heat to medium-low. Cover and cook until the meat falls apart, about an hour and a half. Allow the meat to cool (you can refrigerate it overnight). Remove the beef from the broth and shred it. Use a large spoon to skim the fat off the broth. Discard the fat and save the broth. Refrigerate all ingredients for up to two days as you prepare the other tamale ingredients. You can also make the sauce ahead of time and refrigerate it for two to three days as you prepare other parts of the tamales. In a large pot, heat 2 tablespoons of the oil on medium-high until it shimmers. Add the onions, ancho chilies, jalapeno chili, and New Mexican chilis and cook, stirring occasionally, until the vegetables are soft and begin to brown, 5 to 7 minutes. 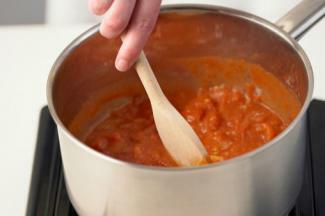 Add the tomatoes and cook, stirring frequently, until it simmers, about 3 minutes. Return the pot to the stove. Add the remaining 2 tablespoons of oil, heating until it shimmers. Add the masa harina and cook, stirring constantly, for 1 minute. Stir in the broth, honey, oregano, cumin, cloves, allspice, and salt. Bring to a simmer, stirring frequently and cooking until the sauce thickens, about 4 minutes. Return the contents of the blender to the sauce. Simmer on low, stirring frequently, until the sauce is thick, about 30 minutes. The masa uses much of the remaining reserved beef broth to moisten the masa harina. You'll also need lard or shortening in this step, because using a liquid vegetable oil will not allow the masa to reach the desired texture. In a large bowl, combine the masa harina and hot water, stirring to mix. Cover and allow to sit at room temperature for a half an hour. 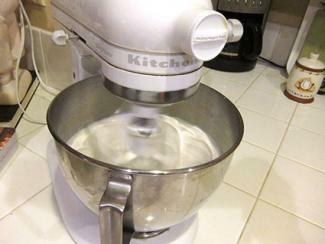 Using a hand mixer (or a stand mixer) in a large bowl, whip the shortening or lard for 2 minutes. Add the sea salt. Continuing to mix on medium speed, working in 2 tablespoon sizes, add the masa and water a piece at a time until you've used about half of the masa. Next, alternate 2 tablespoon portions of masa with small amounts of the broth, continuing to mix, until you've added the remaining masa and about 2 cups of the broth. Continue beating for about 2 minutes more, or until fluffy, adding 1/2 cup of the chili sauce as you do so. If the mixture seems too dry, add up to 1/2 cup more of the broth. Test the masa by adding a tablespoon to a cup of cold water. If the masa floats, it is ready for use. Otherwise, continue beating, testing again until the masa floats. The final step is assembling and steaming the tamales. You will steam the tamales in corn husks for added flavor. In a large bowl, soak the corn husks in the boiling water for 45 minutes. In another bowl, mix the shredded beef and 2 cups of the chili sauce. Lay a soaked husk on a flat surface, trimming it if necessary. Blot it with a paper towel to remove excess liquid. Using a spatula, spread about 1/3 cup of the masa evenly over the corn husk, leaving about a half-inch border around the edges. Spoon about 3 tablespoons of the beef mixture into the center of the masa. Fold the corn husk in half lengthwise, making the edges meet evenly. Next, fold the top edge halfway back so its edge runs along the center of the tamale. Fold the edges down to cover the meat, masa, and the seam. Turn the tamale over so the seams face down, putting them on a rimmed baking sheet. Continue until you are out of ingredients. If you like, you can tie the tamales with strips of corn husk to seal the ingredients inside. Fill a deep stock pasta pot with a pasta insert with water that is just below the level of the insert. Bring the water to a boil on high heat. Carefully lay the tamales in the pasta insert, standing upright. Put a lid on the pot and steam for an hour and a half, keeping the water just above a simmer but below a full rolling boil. Add water as needed. Allow the tamales to rest for 10 minutes before unwrapping. Warm the remaining sauce and serve with the unwrapped tamales on the side for people to use as needed. While making authentic tamales is a time-consuming task, the resulting food is well worth the effort. When you make the beef and chili sauce ahead of time, it only gives you a little work to do each day, and you'll have delicious tamales to share with friends and family.